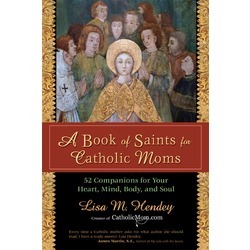 When I received my copy of Lisa Hendey’s new book, A Book of Saints for Catholic Moms, I did a little dance in the driveway. I’m nerdy that way — who doesn’t love to get stuff in the mail? When it’s a book — JOY! Of course, I immediately sat down to read it, but rather than starting on page one, I flipped around, stopping to read when I recognized a favorite Saint, but also when I ran across a Saint that I didn’t know. I spent about an hour reading in this manner, and I didn’t realize how much time had passed until my husband asked if I had picked up the mail. Oh! I was that engrossed! One of the things that I like about Lisa’s writing is that it comes from a practical place. Her first book, The Handbook for Catholic Moms, is a resource that can be used, re-used, and adapted to mothers’ needs. A Book of Saints takes that to the next spiritual level. As mothers, we are well-aware of our responsibilities to provide sound instruction for our children, but we also need to nourish ourselves spirtually along the way. In spite of my enthusiastic jump into the book and the sporadic jumping around to get a feel for the contents, I recognized a different gift in the book. Lisa presents us with companions on a faith journey that spans a year. One part history, one part reflection, and one part mini-retreat, A Book of Saints for Catholic Moms will slow me down. I love that. It meets me where I am (needing some spiritual growth) and asks of me something I can easily work into my busy schedule (52 saints instead of a daunting 365). Whether I sit down with my new companions for a little while every day, or in a weekly marathon session to get everything read at once, I know I’ll be a better mom and a better Christian for spending time in the company of Saints. Maria, thank you so much for you amazing support of this project — I’m so blessed by our friendship!